Making cute stuff is fun, isn’t it? I’m not gonna bore you with a story today. Probably because it’s Sunday evening and my brain is weekended out. And because I know some of you might not feel like reading right now…I get it. But, that’s cool…the fact that you even stop over here to see what I’m up to is amazing to me. So, less words…more sweets today. This special treat is based on the Santa Hat mix I made in December. I decided it needed a makeover for the other 11 months of the year. So, here for all the other months is Party Hat Mix. 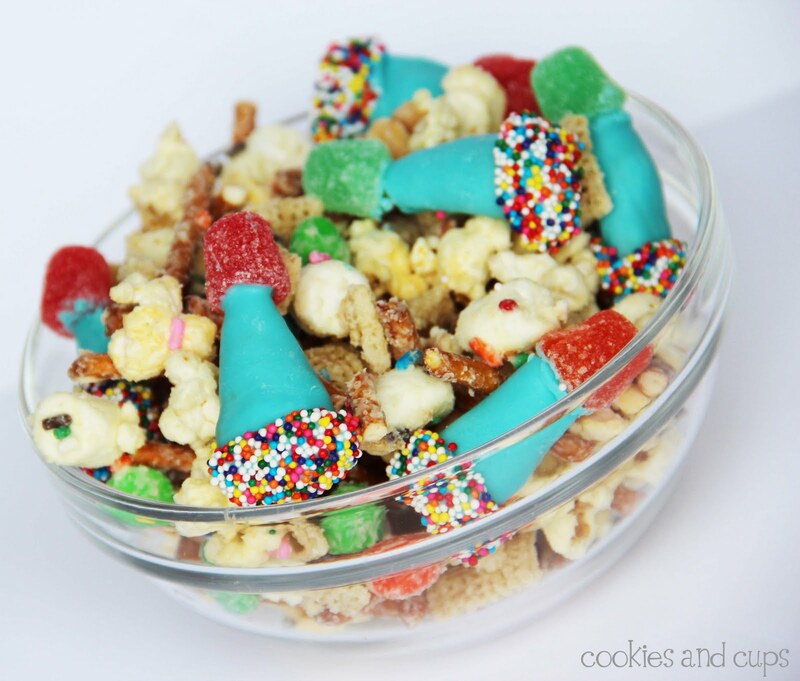 The fun part about this mix is it is great with or without the Party Hats because the mix itself is super yummy and also perfect for any occasion. Because it’s Cake Batter Party mix. Yep…Cake mix in the mix. 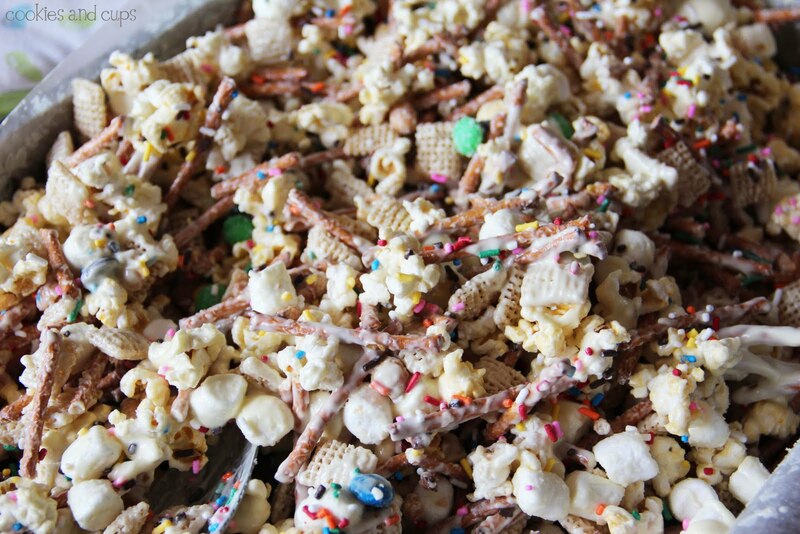 There have been so many fun treats going around with cake mix added I decided to give it a go in snack mix. Melt the candy disks (and 1 Tablespoon Vegetable shortening ~ optional) on medium power for 1 minute and then stir, continuing on in 30 second increments until melted. Gently Press your Spice Drop on the top of the bugle holding from the bottom. 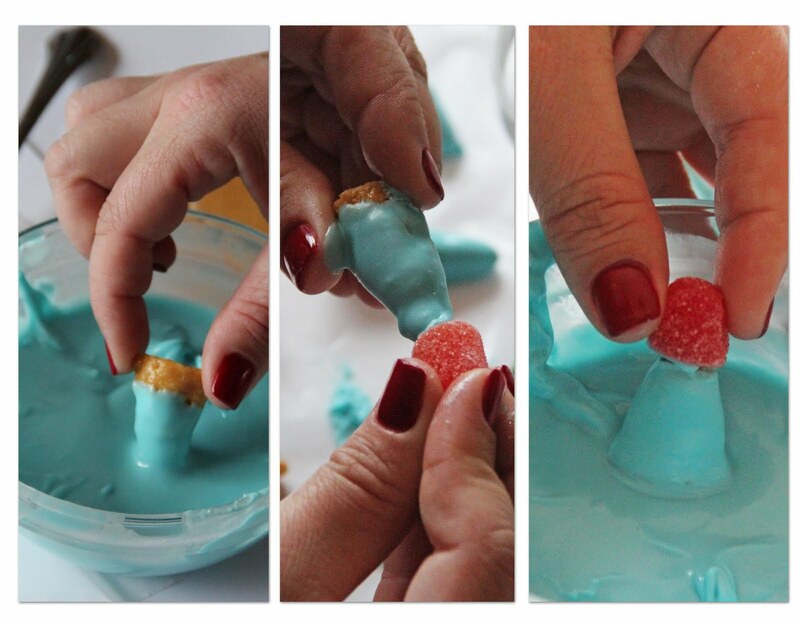 Now dip the bottom in the melted candy. and immediately dip the bottom of the Bugle into them. Gently place each “hat” onto wax paper to dry. When the hats are setting you can make your snack mix. 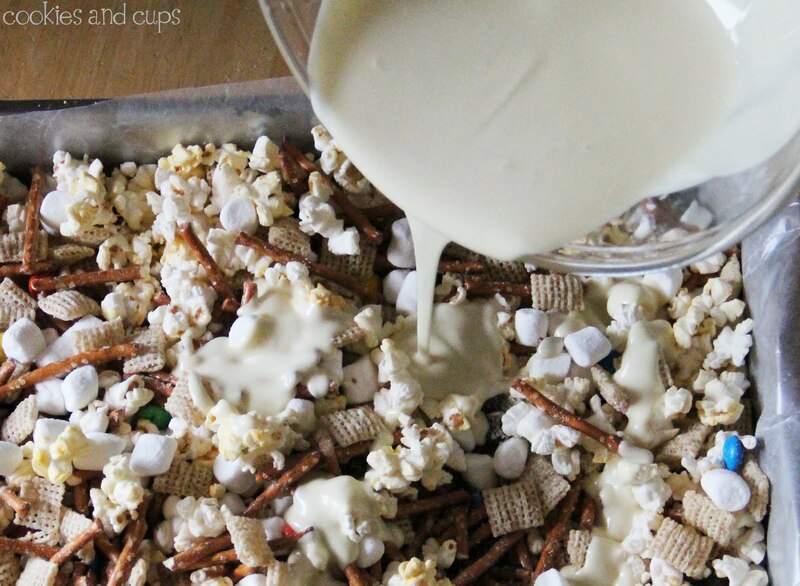 In a wax lined roasting pan combine popcorn, pretzels, Chex, peanuts, Marshmallows and M&M’s. 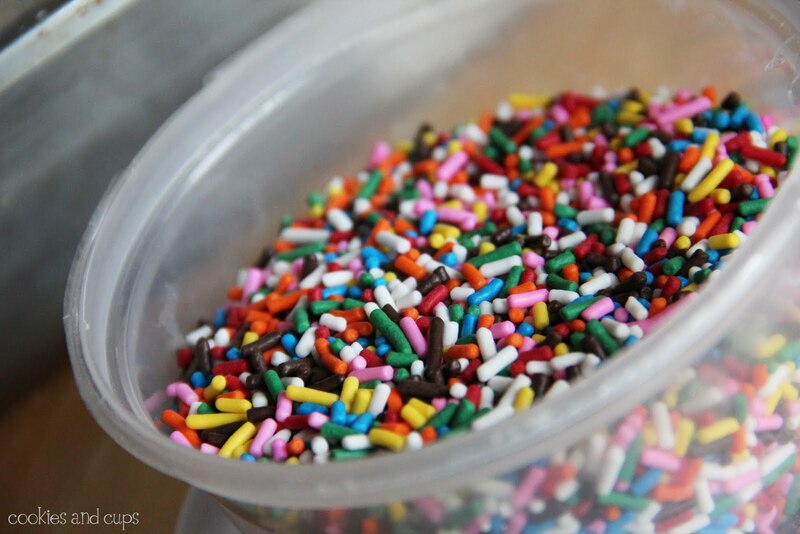 Sprinkle evenly with dry cake mix. Over a double boiler (or in microwave) melt your white chocolate. When melted pour over your mix. Using a spoon stir until the mix is evenly coated with white chocolate. 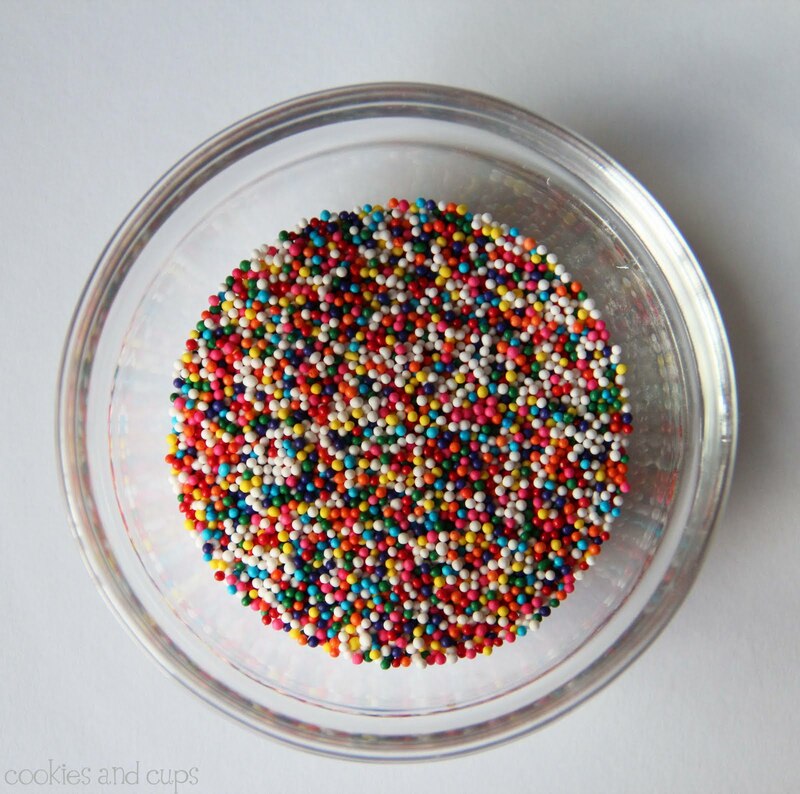 Sprinkle the rainbow sprinkles on top and stir to combine. Let sit until chocolate is set, 20-30 minutes. 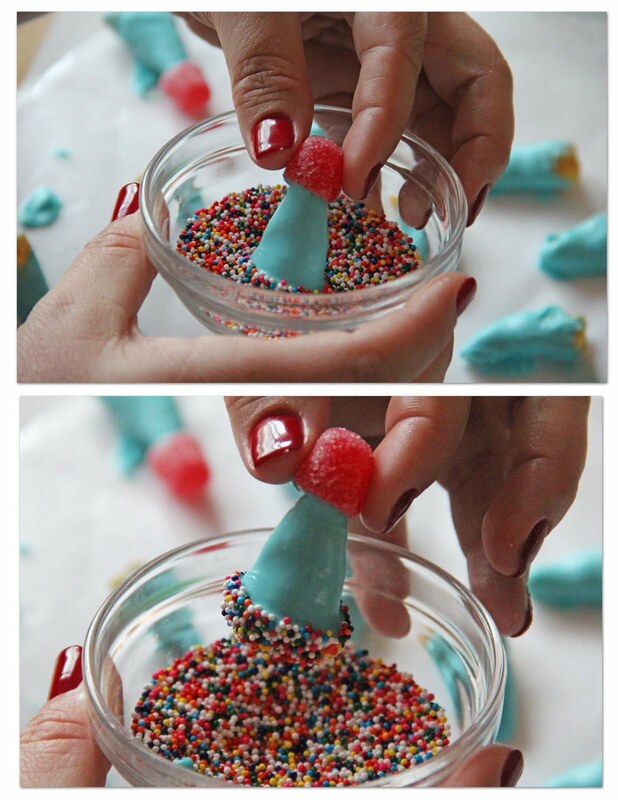 Once the chocolate is set you can add your party hats combining them evenly throughout the mix. There you have it…easy, super cute and yummy. I did read this post and loved it! I agree…I read you every stinkin word girl!! 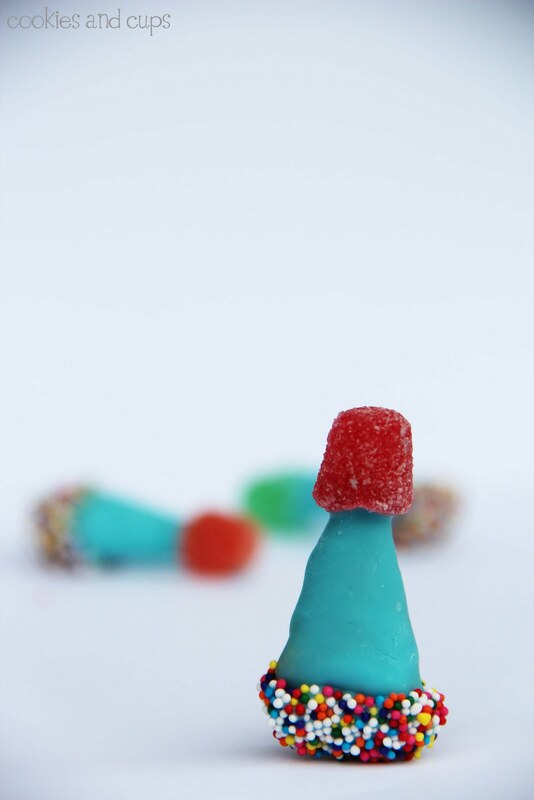 Ok, the little hats are cutie patotie…you need to add a little sign in the middle of the yummies that says, "yea me!" Have a great week! OMG this is an amazing invention. I always love reading your stories, but this mix speaks for itself:-) Such a fun treat! I can't wait to try this. Cake mix in the mix- who'd uv thunk it! You just don't know how incredibly happy this party in a bowl makes me. How absolutely fun! I am going to share it with my readers tomorrow! Cutest little snack mix ever! You're a genius! woah nellie . . . that is a party in a bowl . . . and yes, i read every word . . . and i do mean every. single. word. Oh my gosh….this is GENIUS AND ADORABLE!!! Love it! 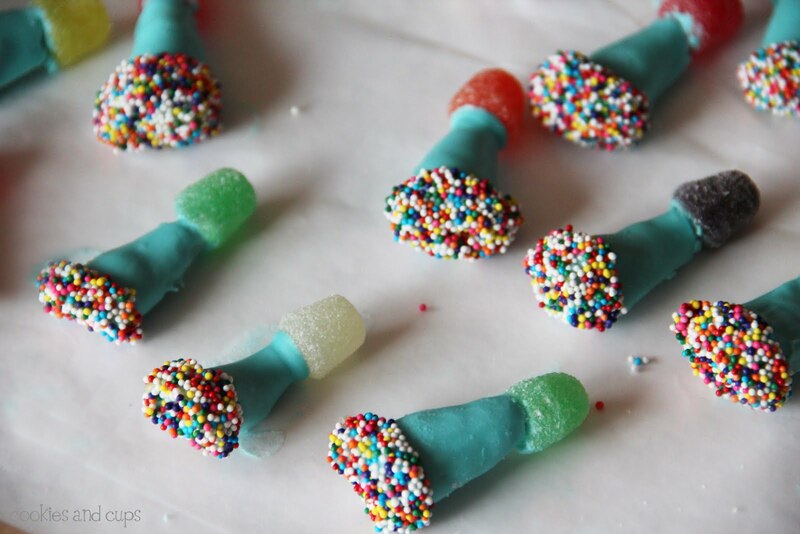 Adorable and easy to make, perfect!! I read every word, weekended out or not. And, uh, hello? Party in a bowl! Kind of like a party in my pants, but classier. Oh my goodness… how cute are those? 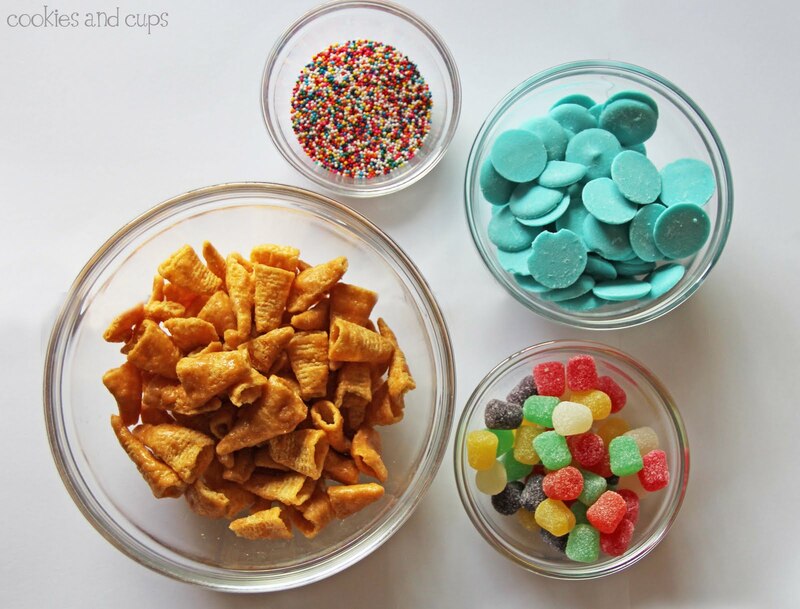 Loving this snack mix! Yum. Cute and delish. Does it get any better? What a great idea! I'm loving all the recipes I'm finding lately for using cake mix in various things, and this is another one to bookmark. The hats are so cute! That's a giant bowl of yum right there. I am getting into using the bugles too – have you seen my neopolitan cupcakes? A great idea. I made the santa hats at christmas and my family friends loved them and I had to make another batch for them. Guess what would be cute? Halloween witch hats. Hint hint. Figure out how to do that and we can't wait to see it and eat it. Is it weird that I kinda sorta want to have a party just so that I have an excuse to make this? And by party…I mean party of one in my kitchen dancing to Glee? Cause that's what'll be going down. Those hats are adorable! What a cute idea! And the party mix sounds SO good! Oh my goodness! I have never seen something so adorable in my life! And it sounds absolutely delicious to boot – perfect! i definitely envision some red and green santa hats come christmas time! These look oh soo bad for me. LOVE 🙂 Need to wait for an occasion to make this. Who doesn't like cute food? So adorable. I just might have to make it and we don't have kids yet…so it would just be for us! Sounds yummy! The Santa Hat mix was great. Everyone loved it. So I bet this one is just as good. This is probably the most adorable snack I've EVER seen. Hopefully I can practice some self control and make it and not eat it ALL before anyone sees it. Sounds delish! SUPER-CUTE!!!! 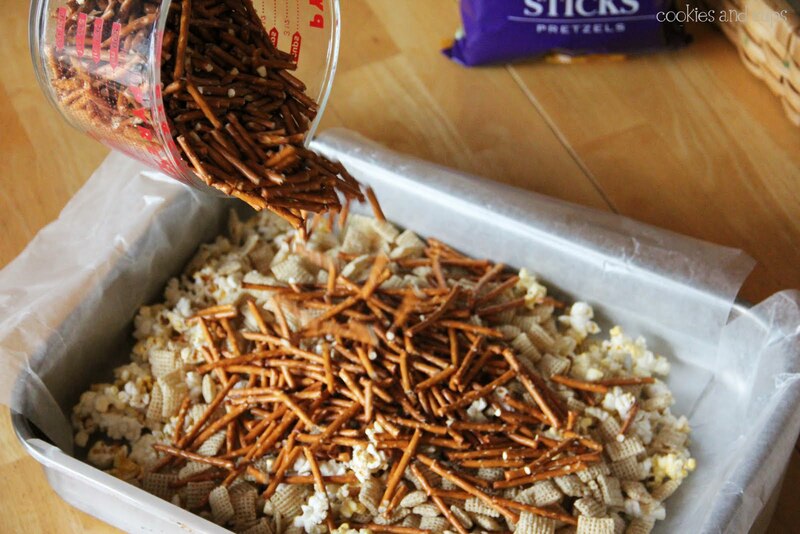 Love your PARTY mix! Oh Mah Gah. This is crazy. CRAZY! I love it. I love you. And even though I haven't had Bugles in probably 15 years, I am in desperate need of some. With a Zeltzer Selzter. Mmm. ADorable and Scrumptious! You rock my world!! I love your red nails in the pics! it's your signature! SUPER DUPER cute idea. I love sweet and salty. Mom and I did the Santa version. Everyone thought we were so cool and creative, LOL. Holy WOW, this is INSANE! You are so, so amazing to come up with this. I will definitely be bringing this to the holiday gatherings this year… I might even swap out the party hats for the Santa hats, since I love the idea of cake mix party mix! The little party hats (and the Santa hat version) are the cutest little things I’ve ever seen!!! I am dying to try the party mix.